You’ll find your order number on your order confirmation email or letter. Hi there, thanks for choosing Optus to be your new service provider. Are you able to send and receive SMS with your old SIM? Log into My Account and scroll down. If you don’t have My Account, you can chat to our team to assist you further. 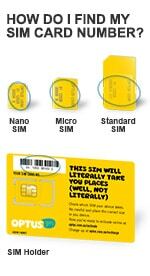 Need a SIM for your old phone? Download the My Optus App. Read more about the My Optus app here. My Account gives you detailed usage for all your services. We also have usage alerts for most personal mobile plans. Three super-easy ways to pay your bill! GET TO KNOW YOUR BILL. We hope we can make it easier for you to understand them.